Electronics and wildlife! Down under transplant, reader, friend, and former colleague Simon M. noted that the latest xkcd cartoon combines two of my favorite things: wildlife and electronics! When I saw the cartoon yesterday, I just smiled – it didn't occur to me that a lot of people wouldn't get it. Red and yellow are two of the ten standard colors used for coding the value of components (especially resistors). It's a very old system, predating me considerably, and it's used worldwide. I've been familiar with it since the early 1960s, so it's second nature to me. 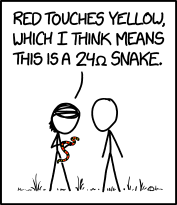 Red is the code for 2, and yellow for 4, hence the reference to “24” in the cartoon. The omega (Ω) is the symbol for ohms, the unit of electrical resistance.